For quick and easy solutions to your everyday fashion needs, look no further than Slinky. Enjoy a variety of stylish dresses and coordinates that mix and match to create incredible ensembles that are comfortable, easy-to-wear and perfect for any occasion. I love the original fabric. I have this dress in navy and black and would buyMore colors if offered. Would love toHave this in brown and a deep forest green. PLEASE bring back more of the original slinky fabric in more colors in the great basic shapes you already offer! 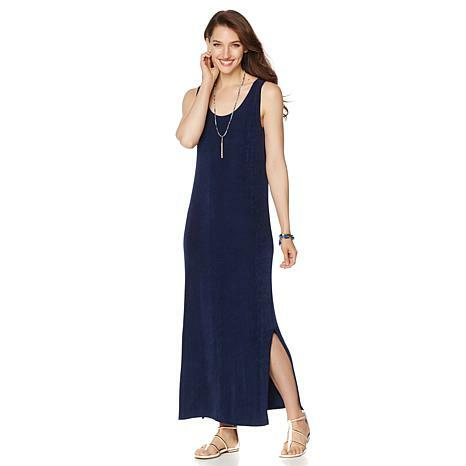 I have been looking for a navy dress and this one is perfect. Slinky Brand Original, are just the BEST, the fit is fantastic, flowy fabric, can be a little warm depending on where you live, washes well, hang to dry. I wish she still had more of the originals. Great purchase. The dress is perfect. It's light, comfortable and a good fit.